What good to me is the festive garment of freedom when I am in a slave’s smock at home? Physics is nothing but the ABC’s. Nature is an equation with an unknown, a Hebrew word which is written only with consonants to which reason has to add the dots. Not only the entire ability to think rests on language… but language is also the crux of the misunderstanding of reason with itself. Indeed, if a chief question does remain: how is the power to think possible? – The power to think right and left, before and without, with and above experience? then it does not take a deduction to prove the genealogical priority of language. Every phenomenon of nature was a word, – the sign, symbol and pledge of a new, mysterious, inexpressible but all the more intimate union, participation and community of divine energies and ideas. 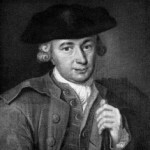 Johann Georg Hamann was born in Königsberg, Prussia. He was a German Protestant thinker, fideist, and friend of the philosopher Immanuel Kant. His distrust of reason led him to conclude that a childlike faith in God was the only solution to vexing problems of philosophy. He studied theology at the University of Königsberg. His first publication was a study in political economy about a dispute on nobility and trade. He wrote under the nom de plume of “the Magus of the North”. His main concern was to reconcile philosophy and Christianity.